There’s nothing like hitting a point in genealogy studies where you are chunking right along and you trip over a historical event you actually know or actors with whom you are familiar. Sure, there are the big things like wars and immigrations. I have ancestors who fought in every single major American conflict over the last 300 years. I have had ancestors who have immigrated from Ireland, England, Germany, and others. I have ancestors who invaded England from France in 1066. None of it compares to the feeling I had the other night when I traced one of my father’s ancestors up through Wales to a fellow known as The Blue Knight of Gwent. Catchy name, right? He sounds like a protagonist to me. Sir William ap Thomas. THE BATTLE OF AGINCOURT? Okay, so maybe I’m a bit of a Shakespeare fangirl. Maybe I squealed like a twelve-year-old girl when I got the Hollow Crown trilogy for Christmas the other year. And… possibly… I teared up a bit when my brother and sister-in-law returned from their honeymoon with a leatherbound copy of Shakespeare’s Histories. Me? I’m descended from a man who spilled his blood in the vasty fields of France? Back it up! Who was this guy, William, and why was he blue? William ap Thomas was born in Wales around 1380. 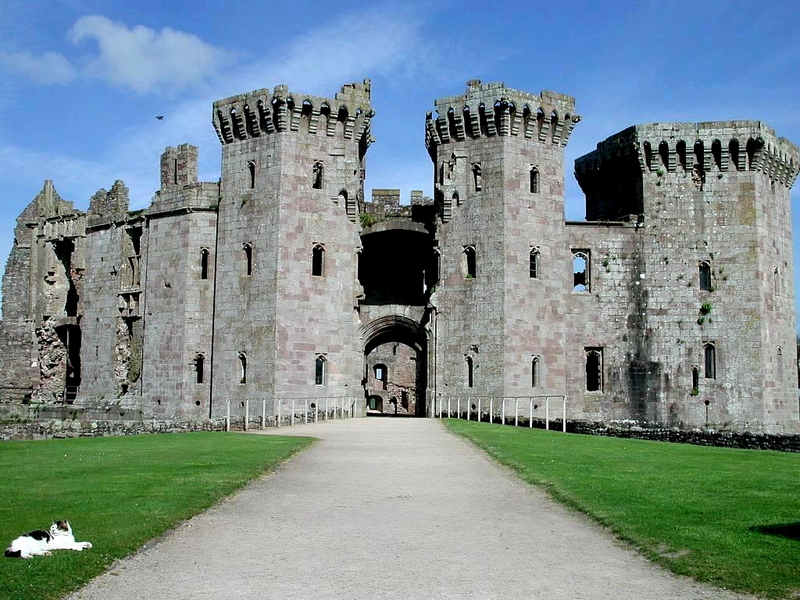 He was a minor member of Welsh gentry and was responsible for starting construction on Raglan Castle. William ap Thomas was born in Wales around 1380. 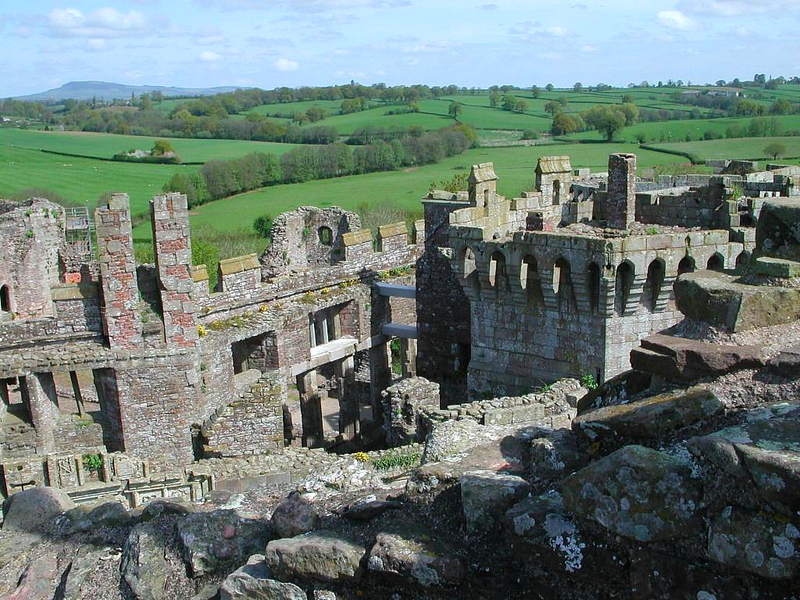 He was a minor member of Welsh gentry and was responsible for starting construction on Raglan Castle. He acquired this property during his first marriage. His second marriage was to yet another heiress, who was yet another daughter of yet another veteran of Agincourt. So the battle of Agincourt was in 1415. Upon returning to his inherited county seat, William became the steward of Abergavenny in 1421. William was knighted by Henry VI in 1426. Side note: I’m descended from a man who was called, “Y marchog glas o Went” – The Blue Knight of Gwent – on account of the color of his armor. He was appointed High Sheriff of Cardiganshire and Carmarthenshire in 1435. In 1440, he was appointed the position High Sheriff of Glamorgan. In 1442 or 1443, William became Chief Steward of Richard Plantagenet, 3rd Duke of York’s estates in Wales. He was a member of the Duke of York’s military council. While William played an active role for the Duke of York, his sphere of influence was generally limited to South Wales. A fairly successful career chappie, in all. He croaked in London in 1445, but was brought back to Wales and buried in a Benedictine priory in Abergavenny. He was succeeded by his eldest son, who went by Herbert… for no apparent reason. Welcome to Genealogy. But this area of my genealogy is littered with references to those who fought for our beloved Hal – and we shall be returning to the frightful fields of Agincourt with another genealogical tale soon. What! How awesome. I just watched the Kenneth Brannagh Henry V (still prefer the Hiddleston one though). I adore the Hollow Crown Henry – in all of his plays. That monologue at the beginning of V when he rails against the Dauphin’s insolence and speaks of the coming war puts goosebumps on my arms. Every time. I also used that adaptation to convert a few normal friends into Shakespeare fans. They thought it was a-okay until Henry started courting Catherine. Then they were puddles on the floor. Score for the Bard… and the Hiddleston.